With frigid artic temperatures swirling through Rye and environs as of late, the deadly wildfires that roared through the state of California in 2018 may now seem like a distant memory. Mainstream media has since focused its lens away from the stark images of charred houses and burned-out cars. However, only a few short weeks ago the Camp Fire ripped through the ironically named town of Paradise in Butte County, CA to become the deadliest and most destructive wildfire in California history. Scientists and other experts agree that climate change is one of the key driving forces behind an upswing in the number and extent of forest fires across the western United States. Hotter temperatures combined with drier conditions resulting from drought and drops in annual precipitation make the perfect recipe for an extreme fire event. Large wildfires in the United States today burned more than twice the area they did in 1970, and the average wildfire season is 78 days longer. This trend is only expected to worsen as climate change intensifies. Urbanization, changing land-use patterns, and even the arrival of invasive species are contributing factors. According to a 2012 University of California study, non-native grasses were more prevalent in areas that had been burned than native grasses were. The razing of landscapes by wildfires enables invasive species to take root, and invasive species then set the stage for more fires. A vicious cycle leading to the accelerated degradation of local habitats results. Forest fires leaves behind ash and charcoal in their wake, both of which promote nitrogen replenishment in soil and act as natural fertilizers. Fires also leave behind standing dead trees (snags) and fallen logs that further enhance soil nutrient levels as they decompose. The increase in available nutrients boosts microbial life on the forest floor. In fact, fire is so rapidly restorative to soil nutrients that it’s not uncommon to see new growth within a few days of a burn. Decomposing snags and fallen logs, often referred to as ‘legacy’ trees, not only boost soil nutrient levels but also provide critical habitat and food sources for wildlife, insects, bacteria, and fungi — all key players in the forest ecosystem. Microorganisms such as fungi and bacteria are some of the first denizens of dead trees as they move in to process and break down the lignin in the wood. Rotting wood also attracts an array of important insect populations, including beetles, worms, snails, and woodlice which, in turn, provide critical food sources for birds and small mammals. Woodpeckers, owls, squirrels, and even black bears use the cavities inside snags for nesting, denning, and shelter. Pine barrens, found in southern New England, into Long Island and covering vast swaths of New Jersey, are inhabited by scrub and pitch pine. These native evergreens are adapted to withstand and survive fire and depend on it for reproduction. 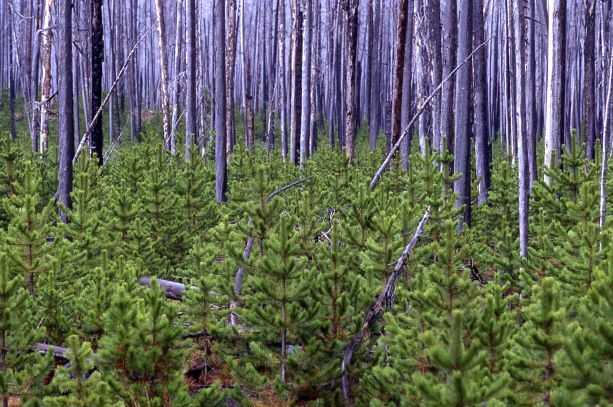 To release their seeds, the waxy seal enveloping the cones of these pines must be melted via exposure to the high temperatures of a fire event. Northeastern pine barrens are home to rare plants such as blazing star, wild lupine, and sandplain gerardia (an endangered species) that also need fire to reproduce. Delmarva fox squirrel and red-cockaded woodpecker rely on fire to maintain these unique pine forest habitats. The decomposing fallen logs that accumulate after a large fire act as “nurseries” for new seeds by providing them with water, shade, and a nutrient-rich base in which to take root. Many seeds germinate and sprout on downed trees bestowing them with the monikers “nurse logs” and “ecosystem hot-spots.” These “nurse logs” facilitate forest regeneration by furnishing a critical breeding ground for innumerable plant species. Fire contributes to the control of competing plant species in the oak-hickory forests found throughout the eastern U.S. While other competitive species growing in these forests often perish in the path of a large fire, oaks are resistant to fire and subsequently benefit from the nutrients returned quickly to the soil during a burn. Fire also stimulates new sprouts in shagbark hickory. As Winter 2019 draws to a close and the warmer temperatures are ushered in, wildfire season will soon be upon us again. Let’s hope that this season’s fires are not exacerbated by human activity and remain contained to the areas inside forests where they will exert a regenerating and beneficial effect upon the natural ecosystem. Californians and residents in other fire-prone western states are surely hoping for a similar outcome.